Finding a free or low-cost attorney in NYC can take months. Until then asylum seekers are desperate for accurate & accessible information about the asylum process for both practical and psychological reasons. During sessions led by a volunteer attorney, clients learn about the requirements of the asylum application and how to make the best use of their time while searching for an attorney (e.g. gathering evidence and documentation to support their case). Clients are also cautioned against fraudulent immigration services in the city and referred to trusted legal providers for further legal support. Each asylum seeker is given a private 20 to 60-minute consultation. As there is no government support for social services and survival resources, asylum seekers are often destitute and isolated. RIF holds bimonthly community meetings where asylum seekers are offered education guidance, mental health support, job search navigation, and information about English-language classes and health insurance enrollment. We also provide food packages to attendees thanks to the generous support of Congregation Beth Elohim. In partnership with the Brooklyn Grange, we offer asylum seekers a paid fellowship in urban agriculture. 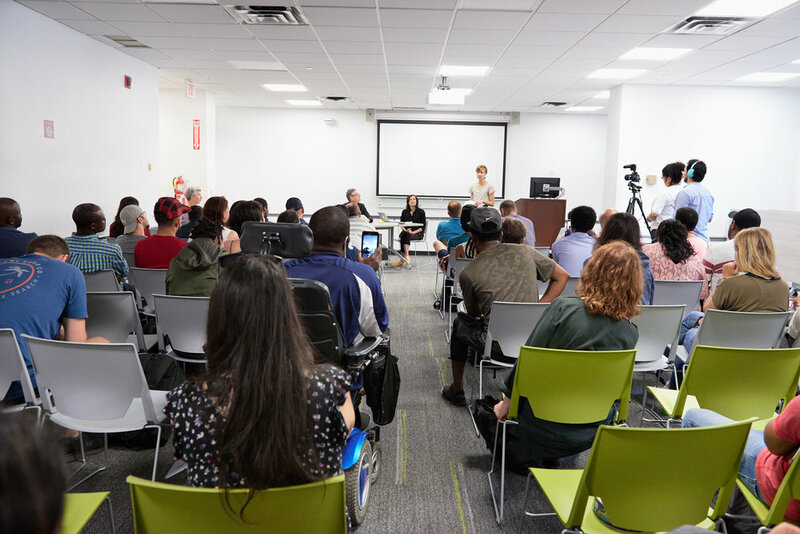 The three-month training program prepares asylum seekers for life in NYC via job readiness training, English immersion, psychological healing, and community building.